It's a slight Zuma rip-off - but a good one. 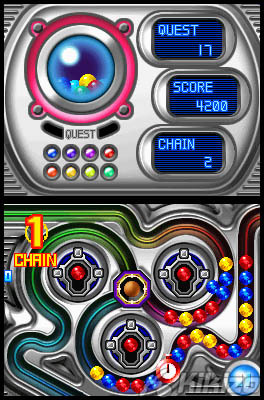 The main game mode is quest, where the levels do not last as long and your main goal is to clear it to progress to the next one. 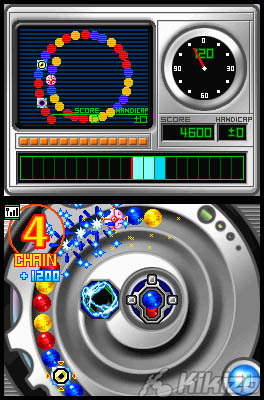 The progression through difficulty here is really well done; staring with the simple circular loop you quickly progress to track which pass through each other, then on to multiple tracks with multiple chains of gemstones rolling towards multiple ends. "The 'one more go' drive to complete a tricky level is absolutely compulsive." 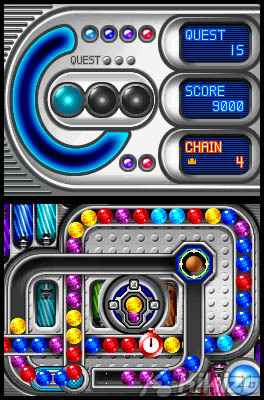 Luckily, the game grants you multiple cannons for some of these levels, although if you fire a ball from one the next colour ball arrives in them all. This makes picking which cannon to shoot from tough, as you really need to worry about which chain is closest to bringing the dreaded game over screen. Checkmate sees you presented with a chain of gemstones which do not advance. 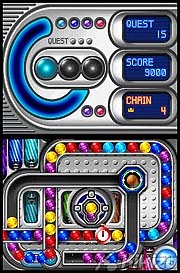 You are given a set number of gemstones to destroy all the stones on screen. This is a welcome twist and forces a chess mentality where you have to think moves ahead. The one thing about Checkmate which annoyed me is that if you clear the gemstones before you use all your allotted shots, it's game over. You need to use exactly the number of gemstones that the game demands you to before you can progress to the next level. Lastly there's a wireless multiplayer mode, and Actionloop sports downloadable levels so your friends don't need to own the game too to enjoy a versus match. 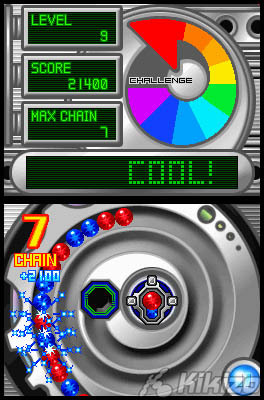 Here the object is to generate blocker stones for your opponent by starting chain reactions on your own screen. 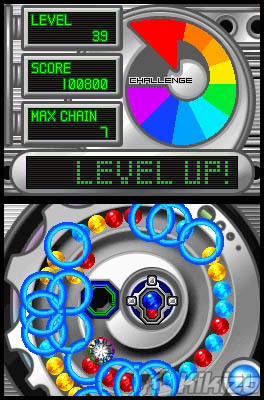 There are power ups and obstacles to collect to improve your own chances and hamper your opponent. Graphically Actionloop does a good job. One issue I have with these kind of games is that I'm colour blind. While I struggle with games such as Hexic, Actionloop is always clear and I haven't been able to blame my eyesight on any mistakes I made. You won't find any stunning scenes in the game, however you'll be too engrossed in the action to miss them. Similarly, the music is fairly nice techno and although it's not dance floor killer material it's certainly not bad enough to warrant turning the sound down. Actionloop also comes with a rumble pack for your DS (which you insert into slot 2). I thought this was weird game to get the rumble pack with! It rumbles when you get a warning if the gemstones get close to the hole, and when you pick an option from the menus. It does slightly add to the frantic tension when you are close to game over, but it's not nearly powerful enough. Hopefully it's something other developers can run with and make more use of in future games. The last thing I'd like to point out about Actionloop is that it's a budget title, and this really makes it a highly recommended buy. That is, as long as you don't mind scaring fellow passengers on your way about town by screaming incoherently at your handheld and thrashing your arms around as if you're about to fly when you lose. Touch screens will be broken, you have been warned! 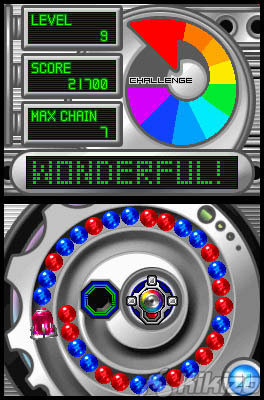 THE VERDICT: Actionloop owes an awful lot to a certain other gemstone based puzzle game, however that doesn't detract from the addictive fun on show here and the DS stylus control brings the game up to a new level. Awesome.